Generally, I make an historical introduction of the artist. For this post, I will only focus in those matters that are important for the analysis of the Sunflowers. As you may have seen, I’m referring to the artist only by his name not because we are close friends, but because Vincent rejected to be known as “van Gogh”. For him, the place of origin of a person was irrelevant. 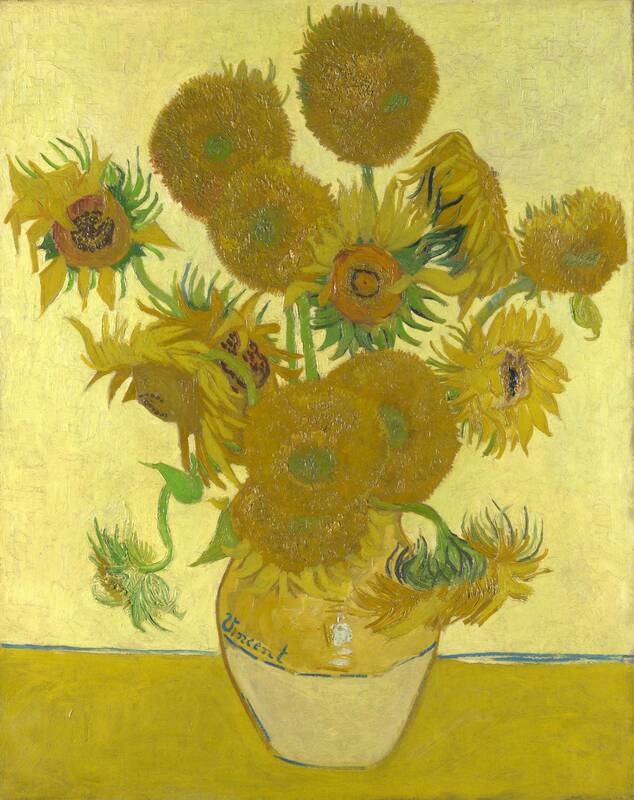 That’s why he signed some of his paintings just as “Vincent”, including Sunflowers. The artist was born in Zundert, a little rural town on southern Netherlands to a protestant family. His father was a minister of the local Dutch Reformed Church and lived an austere and pious life. So Vincent was raised in a deeply religious context, in which he was encouraged to be quiet, shy and introspective. But also, the Christian values of his family made him a kind person, always concerned for others, with a tireless energy to help those in need. From family contacts, the young Vincent worked abroad as an art dealer, as several members of his family belonged to the art world. But his religious sentiment grew and his spiritual concerns increased. In search for his call, Vincent wanted to be a pastor, and is sent to Amsterdam to became one; but the artist was not good at studying. However, he wasn’t discouraged and he accepted a job as a missionary in a coal mine in Belgium. There, Vincent would preach at the same time as would help the workers on their daily tasks. But he went even beyond: moved by compassion, the artist resolved that he would live exactly in the same way the workers did, which lead him to experience hunger, to work endless hours and to sleep over hay. As we can see, Vincent committed very seriously with his projects. And, like he would do with everything, he did it with a concerning intensity. At this point, we can see from this strange behavior that he suffered some kind of mental illness. Although there are many theories regarding the pathology he suffered, we are never going to confirm exactly which was. With 27 years, the artist had a revelation. His mission was to help others. But, as his attempts to become a pastor or to become a permanent volunteer in the coal mine were unsuccessful, Vincent found out that his mission was to redeem humanity through art (his words, not mine). And, from that point on, the artist will devote himself to art. ~ by Álvaro Mazzino on January 31, 2011.
to large set of audience. Deliver memory joggers and also revisaions to everybody or perhaps choose organizations. Thiss is a way to generate leads, collect consumer information, and build customer relationships. Well, for one, they’re cool. Young people love cool things. Jokes aside, sneakers are awesome, and people love them. But these sneakers are more than that. This entry was posted on January 31, 2011 at 17:32 and is filed under Expresionism.You can follow any responses to this entry through the RSS 2.0 feed.You can leave a response, or trackback from your own site.